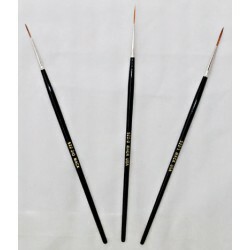 Buy Mack Brush Series 522 Red Sable Dresden Liners These Brushes are available in 3 sizes, with graduated hair lengths. The Series 522 have polished handles, and nickel ferrules, made with Pure Red Sable (long stock) Hair. This style brush is perfect for fine line, scroll work, sign writing, ceramics and china painting. Individual Brush Sizes Listed BELOW!